On the 27th December 2016, we left Melbourne and flew to Sydney to meet Sophie and spend New Years with her. I think we were both ready to go see somewhere new but it was still strange saying bye to Kathryn and Laura and leaving Melbourne after being there for over 1 month. We had got an air b’n’b in a suburb called Redfern for our time in Sydney which meant we had a bit more privacy to chill and catch up than we would have had in a hostel. Sophie had got to Sydney in the morning and we didn’t arrive until late afternoon so we didn’t do much the day we arrived except catch up and have some pizza and wine – it was really good to see her again after so long (she’s been away for over a year). 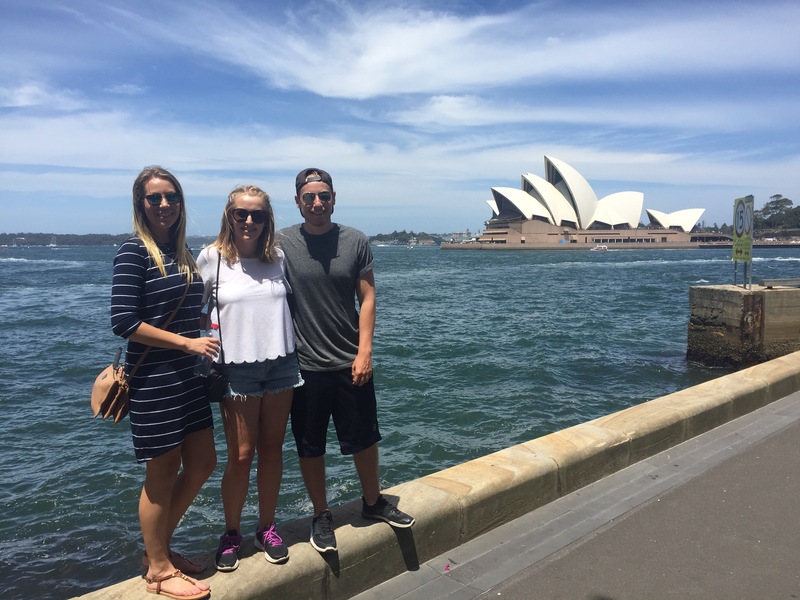 The next day we went to see all the main sights Sydney had to offer. We were all pretty tired and had been woken up by our air b’n’b host that morning when we had planned to lie in so made sure to have a chilled day. From where we were staying we could get a 10 minute train to the the harbour. We had a look around and also had a drink on the harbour in the sun. I was surprised by the Sydney Opera House. It’s actually two buildings, not one like it looks, and the surface is small mosaic tiles instead of smooth like I thought. It was cool to see something in person that I’ve seen to much on TV and in films. After our drink we walked to The Rocks which is an area full of restaurants for some lunch and then walked under the Harbour Bridge to see a better view of the Opera House. You can climb the bridge (it’s super expensive so we aren’t doing it) but we saw a lot of people doing it when we walked under the bridge. One of our last stops for the day was the Botanical Gardens. These were really pretty and had some nice ponds and lakes but we were all really tired and it was super humid so we decided to get some food and head back to our apartment. On our way back we passed through Hyde Park. I liked it here, it was big and open and had a huge cathedral called St Mary’s at one end of it that seemed to run the length of the park. A few days later we went into the cathedral and it’s really pretty with lots of stained glass windows and a warm glow to the place. We have spent a couple of evenings having BBQs and playing cards which has been great. We got burgers (both meat and veggie), salads, skewers and wine – so tasty! I’ve been bitten loads by mosquitos though since being in Sydney, sitting out in the evenings – not the end of the world. 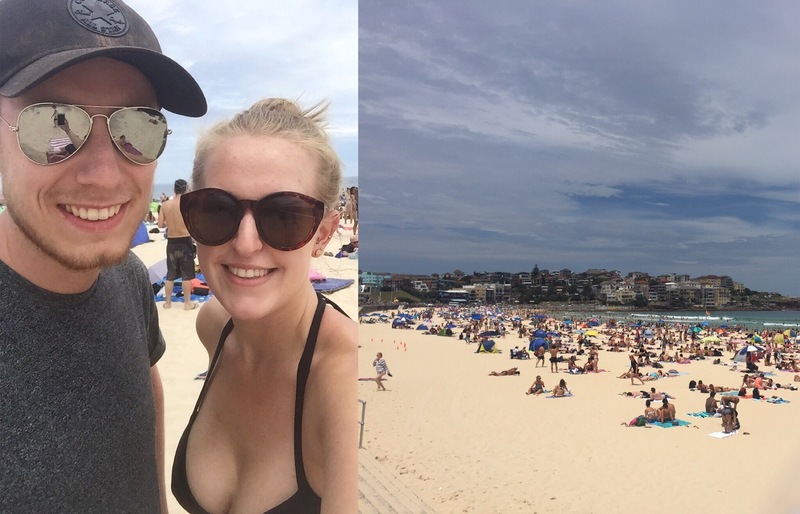 Our next day (29th December), we had temperatures in the 30s so we headed to Bondi Beach. The beach was packed but I guess that’s to be expected considering it was between Christmas and New Years so probably when a lot of people take holidays from work and it is one of the most famous beaches in the world! We got some lunch (me and Sophie had really nice smoothies) and got a spot on the beach. It was a great temperature and so, even though the water was cold, it wasn’t as bad being warmed up by the sun. The waves was probably the best bit, some went over your head and it was fun trying to jump over them – we laughed so much. Despite how busy it was, I really liked Bondi Beach and we had a great day there – I’d definitely go again and will hopefully get to while we are in Sydney. 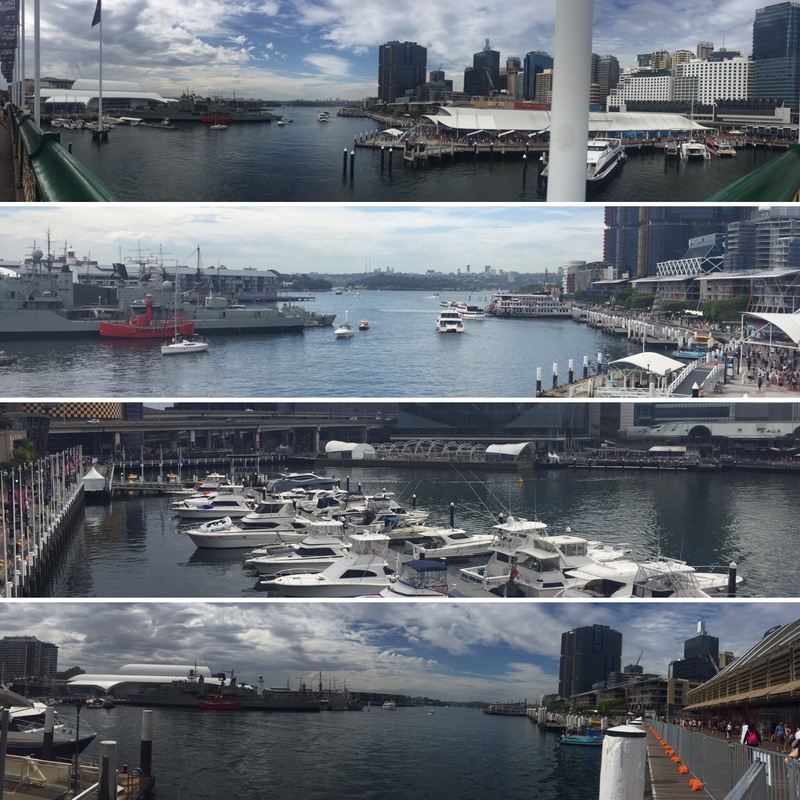 Our next day we visited Darling Harbour. We stopped for lunch and also exploited some of the happy hour deals along the harbour for drinks which was nice. 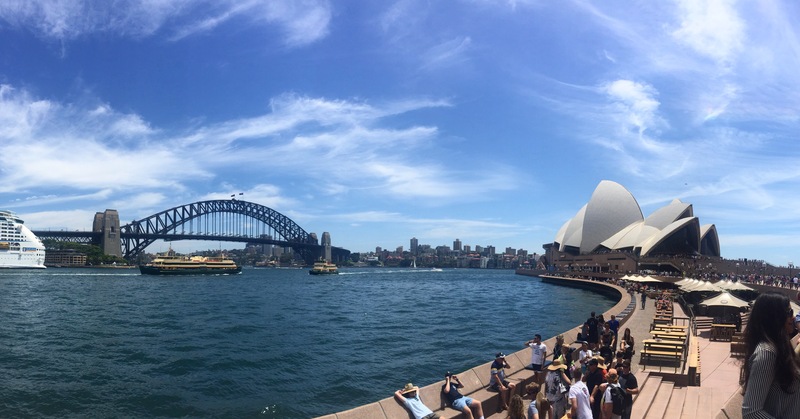 This harbour is where all the tourist attractions are like Madame Tussauds and the aquarium so that area of the harbour was really busy with people queuing for tickets. Its a nice place to visit but obviously doesn’t have the pull of the Sydney Harbour. 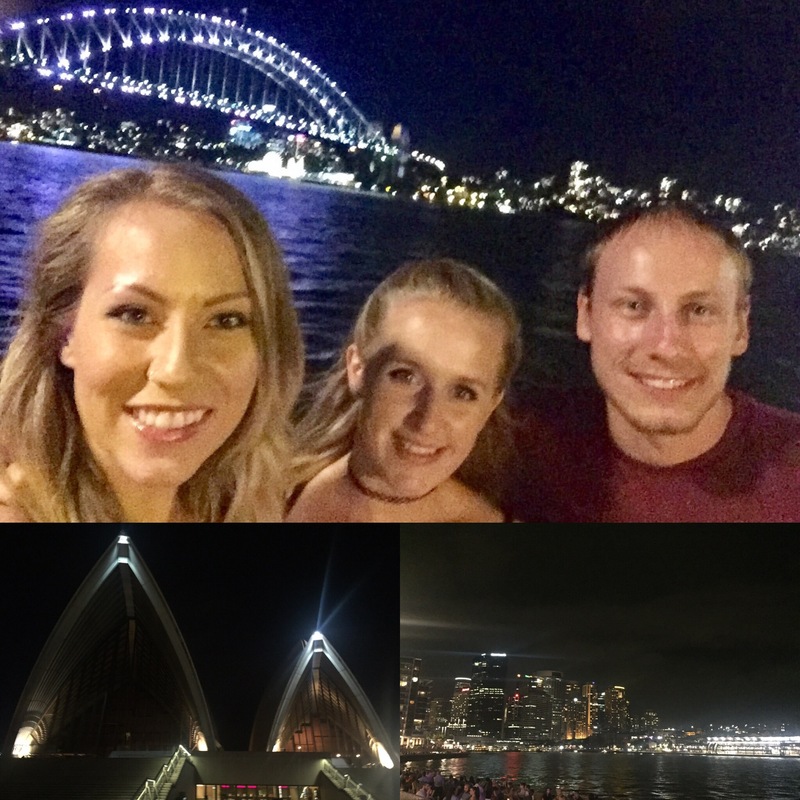 We hadn’t been to see the Opera House and Harbour Bridge lit up at night yet so decided to make a night of it and go out for a nice meal and some drinks along the harbour to see it all lit up. We went to a restaurant called Eastbank which did lovely Italian food at not too an extortionate price (it is very easy to spend hundreds and hundreds of dollars in restaurants here!). We all really enjoyed the food and had some lovely cocktails as well. The harbour is beautiful at night. 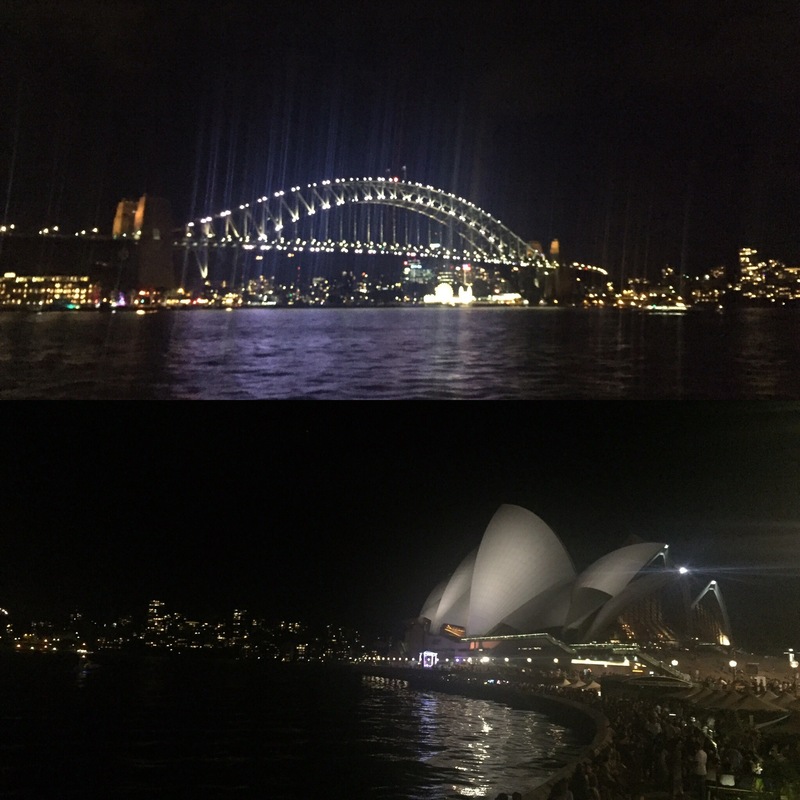 The Opera House is all lit up and then the bridge changes colours every few minutes. It was still very busy, with a lot of people having drinks and meals by the water and we also saw the set up for New Years Eve which was the next day. It wasn’t a super late one for us as we had to get up really early to get our spot for the fireworks – I’m really glad we got to go out for a nice meals and drinks though as we haven’t really done since we have got here what with sticking to a budget on our travels. Bowling got very competitive but was good fun. Sophie won two of the games and Niall won one game with all of us getting strikes, but Niall won with the overall highest score. 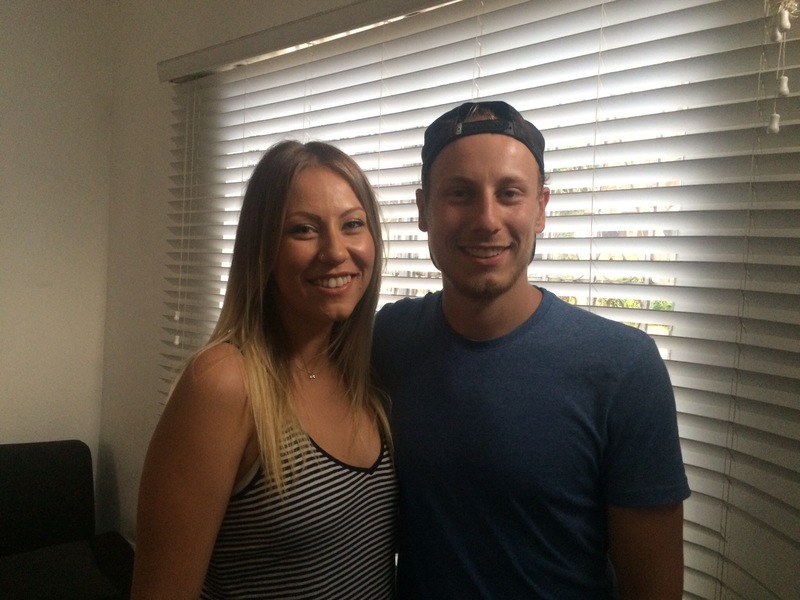 It was nice to have some fun, have drinks and food and just chill together before Sophie left to go home – especially when we aren’t sure when we’ll next see her! Our last morning together was a last look and lunch at the harbour and getting Sophie all packed up for her flight home. 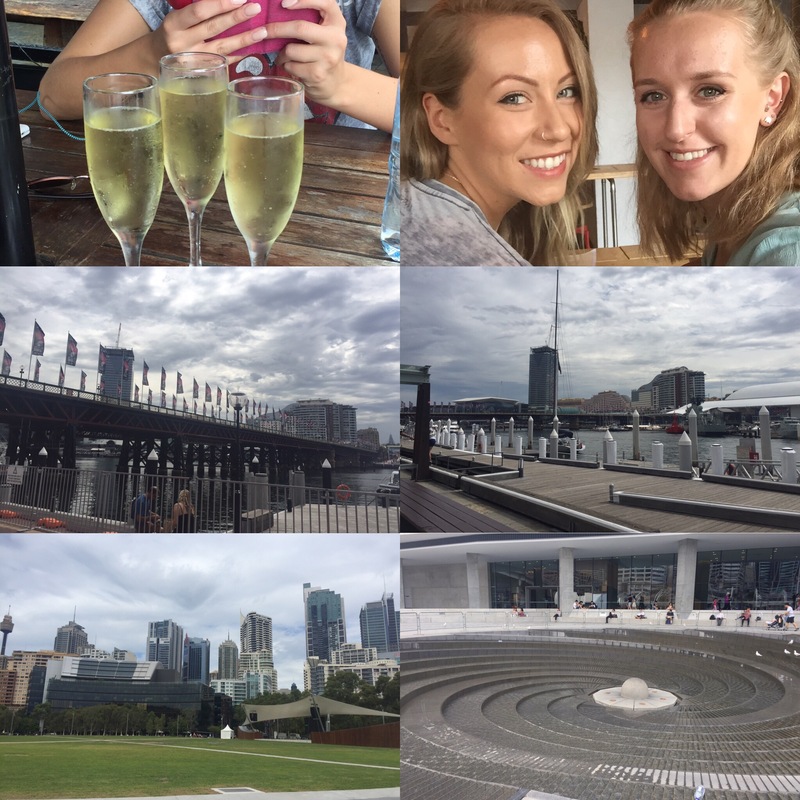 It’s been a nice introduction to Sydney and so good spending it with Sophie. We still have a bit more we can see once the weather gets a bit better – and I’m sure some more trips to the beach as well! Next New Years Eve – Hello 2017!